Hull city no doubt, have been bright since the start of the season. Getting 7 out of a possible 12 points for a‎ promoted team from the championship. They picked up a draw alongside promoted team, Burnley, last weekend. They host big boys Arsenal at the KC Stadium,on Saturday afternoon. ‎Arsenal also are good to go,having come back from a goal down to win a home against the Saints last weekend. After losing just three times in the entirety of last season, the Foxes have suffered defeat twice in their first four matches. With Manchester United, Southampton and Chelsea soon to come and Leicester balancing their UEFA Champions League commitments in between it’s vital they pick up three points at home to Burnley. A number of Leicester players have struggled thus far to replicate the form they enjoyed last season, perhaps none more so than PFA Player of the Year Riyad Mahrez. The Algerian is yet to contribute a goal or an assist since netting a penalty on the opening day against Hull, and he produced an ineffectual performance at Anfield on Saturday. He has completed just one of his five attempted take-ons and found his man with one of eight crosses, according to EPL stats. Burnley are likely to sit back and get men behind the ball at the King Power Stadium, so as the hosts’ primary creative force it will be up to Mahrez and Musa to unlock their defence. To do so, their dribbling and delivery need to be closer to the level they were last season if not, Leicester’s struggles could continue. Leicester look positive having kicked start their first Champions league campaign on a high,beating Club Brugge of Belgium 4 nil on Wednesday Night,with Mahrez also scoring twice. Man city looks the team of the moment under the new Manger Pep Guardiola having not lost any game in all competitions. They cane out on top last week against close rivals Matchester United in the Manchester Derby and also the most expensive game, with a 2 1 away win. Bournemouth won 1 nil to a frustrating West Brom team last weekend with the goal coming late in the 2nd half. 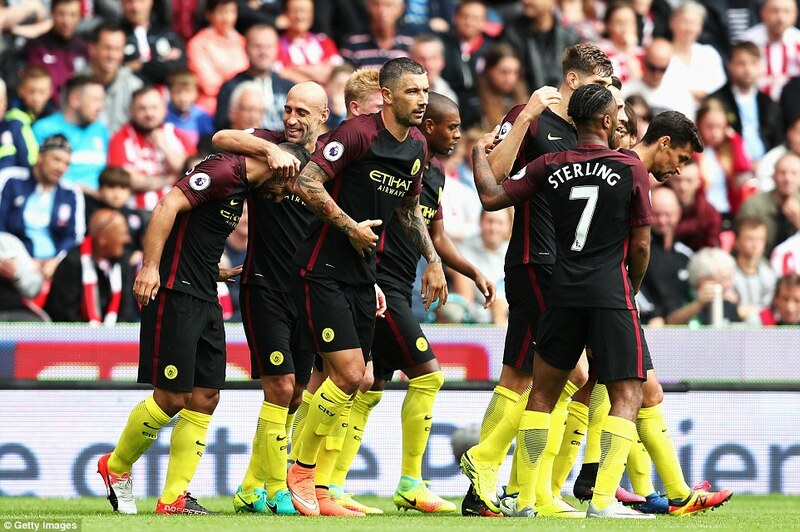 Man city can boast of all three points against the cherries come Saturday Afternoon. West brom lost to Bournemouth last weekend 1 nil in a boring tie,and their manager’s style of play looks so boring and not scintillating to watch. They host west ham this on Saturday a the Hawthorns and would play for three points. Everton and Boro ends the game on Saturday at 5:30 pm. Everton no doubt also are in fine form, and are 2nd on the table,two points behind Manchester city. They have been impressive under new manager, Ronald Koeman. Their Monday night match day 4 game away to Sunderland was another fine performance from the Merseyside team. Goals at both ends looks possible,but Everton should come out top in this. Watford and United begins the Sunday fixtures of match day 5 fixtures. United were blitzed in the opening half-hour of the Manchester derby, going 2-0 down to an inspired City side and never managing to get back on level terms to earn a point. In the second half against Pep Guardiola’s side, though with Red Devils manager Jose Mourinho having thrown on Ander Herrera and Marcus Rashford, United looked much better.They will aim to get back to winning ways on Sunday against the Hornets. Rashford has done all he can to earn a starting berth and could cause havoc in the Watford defence with his pace. Arguably, though, Herrera had the even better performance from the bench against City and has surely put himself firmly in the frame to be included in Mourinho’s starting XI. United will have faced Feyenoord in the UEFAEuropa League only three days earlier, but they cannot afford to be anything but their best away to an excellent Watford side. Walter Mazzarri’s men were ruthless coming back from two goals down to beat West Ham United 4-2 away last time out, with their key men from last season— Odion Ighalo and Troy Deeney both back on the scoresheet. Given his immense experience in the Premier League, Mourinho will understand the importance of getting three points on Sunday against a perceived weaker side and getting back on track after the City defeat. United beat Watford in both Premier League clashes last term and have looked a much better side already under Mourinho than under former boss Louis van Gaal, and they should pick up three points at Vicarage Road given the quality now in their squad. Selhurst park hosts the potters on Sunday, Alan Pardew and Mark Hughes team face each other. From a neutral point of view,one would only expect to see goals in the game. The game should provide goals at both ends. A draw looks affirmative. Southampton have not been so spectacular since the start of the season. They were one nil up away at Arsenal last weekend,but the Gunners came from the goal down to win. They forgot about the loss to Arsenal and focused on the Uefa Europa league,which was a debut for them. They were 3 nil victors over Sparta Prague on Thursday night,with striker Charlie Austin netting twice. Swansea might not be on top of the table, but they look a decent team than last season under the tutelage of Gary Monk. Their recent result against an unbeaten chelsea team is a positive going to the game against Southampton. They could have won against Chelsea as they were 2 1 up in the 2nd half, but Costa scored a 2nd half goal to force a draw at the Liberty stadium. A slim win for Southampton looks possible,but a tough fight from the swans team on the sideline.